The Best At Home Chemical Peels – The Ultimate Guide. Chemical peeling can eliminate a whole host of imperfections including wrinkles, acne scarring, and skin discoloration (hyperpigmentation) among others. 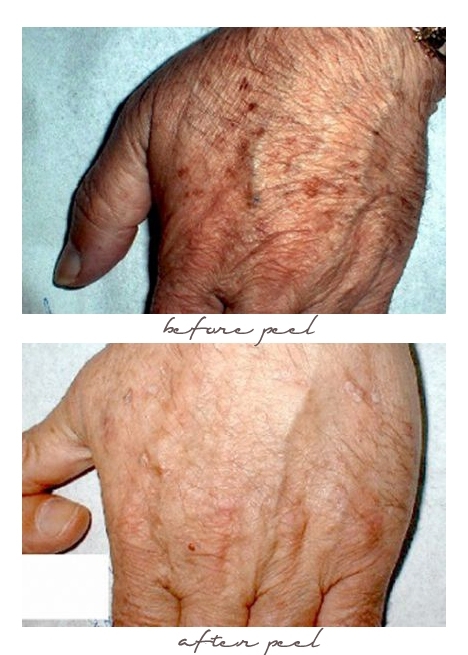 It is the gold standard in skin rejuvenation and is one of the most popular techniques to improve skin damage and maintain youthful and flawless skin. The basic principle is to apply a chemical solution to exfoliate old and damaged skin in order for your body to regenerate a fresh new layer of skin that will be smoother, younger, and healthier. 3.1 Theraderm - Fruit Acid Exfoliant (10% Lactic Acid) 2 fl oz. Save for deep peels, regular chemical peeling isn’t a one-off procedure. It has to be done in a series of 6-10 weekly treatments in order to achieve full results. Having them regularly done at a clinic will cost you anywhere from $150 to $400 PER SESSION. That’s $900 minimum and a whopping $4000 maximum for a series of treatments. Definitely a dent to your bank account! The good news is, you can definitely safely do this on your own and at the convenience of your home with the best over the counter chemical peels. But first, you have to learn what the different types of chemical peels are and what kind of peeling agent is right for you in order for you to achieve the results you want. Also known as lunchtime peels, these are superficial peels that penetrate only the upper layer of the skin. These are mild acids (AHAs & BHAs). Skin problems: Mild acne, blackheads, whiteheads, fine lines, dry and dull skin, minimal sun damage. Pain: These do not hurt at all, only a mild tingling sensation on contact. Downtime: Virtually no recovery time, though you might be a little pink after with bits of flaky skin. It’s called a lunchtime peel because you’re able to go to work straight away. 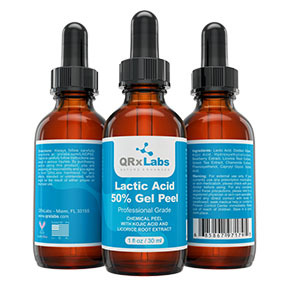 Peeling Agents: Low concentrations (10-25%) of glycolic acids, lactic acids, fruit acids, and Jessner’s solution. Number of Treatments Recommended: 6-10 treatments in one week intervals. The acid penetrates to the middle layer of the skin to remove damaged skin cells. Pain: It will sting more than the light peel but will not be overly painful. The sensation will reduce over time once your skin adjusts to the acid. Downtime: 7-14 days. The skin will be red in the first 48 hours. The skin will crust and peel off during the downtime period. Skin should be soaked in antibacterial solutions followed by ointments to ensure full healing. 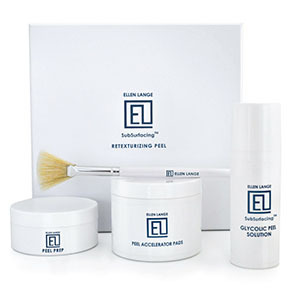 The peeling agent will penetrate deep into the skin to correct damaged skin cells. 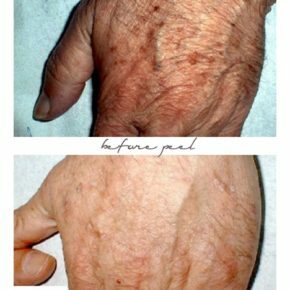 You will see a dramatic improvement to the skin but we recommend that you DON’T DO THIS AT HOME, especially for beginners, as complications or potential side effects may produce permanent scarring. If you think your skin issues require this type of peeling, please visit your local dermatologist and have them assess your condition. The peeling agents used for this procedure should only be administered by trained physicians. Downtime: 14-21 days. There will be redness, swelling, and irritation. The area will be bandaged and must be soaked 4-6 times daily, followed by ointment application. The dermatologist may also prescribe antibacterial and antiviral medication. There will also be several follow-up appointments to monitor the healing progress. At home over the counter chemical peels varies in type and strength. Peeling for maintenance: For those wanting to maintain a youthful glow, regularly doing a series of light peels every 6 months or so will keep your skin in top shape. Peeling for correction: Those looking to correct imperfections like hyperpigmentation or dark spots, acne, or scarring; gradually moving up to a series of medium to deep peels would be your best bet. If this is your first foray into home peeling (Be prepared for your best skin yet! 😉 ), you will need tools like a fan brush and an acid neutralizer for certain types of peeling. You can refer to our Before and After Care Guide or more details. - Fast-acting, quickest acid to penetrate the skin. - Induces exfoliation, skin turnover, and boost collagen formation. - The most popular type of peeling treatment. - Usually with zero downtime; used in most lunchtime peels. - Induces exfoliation, skin turnover, and collagen formation. - Induces skin turnover, and collagen formation. Glycolic acid is a naturally occurring acid found in sugar cane. It has the smallest molecule among all the AHAs, making it fast-acting and able to penetrate the skin at a rapid rate. Peels in lower concentrations can be done quickly and effectively with little to no downtime. 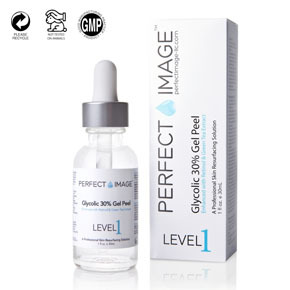 Glycolic acid peels are used to combat signs of skin damage and increase efficacy of everyday skincare products by removing any build-ups on the skin. It has also been proven to be effective against mild to moderate inflamed acne, hyperpigmentation, and melasma. Because of its cost-effectiveness, Glycolic peels are among the most popular type of chemical peeling performed by dermatologists worldwide. These are mostly used for superficial peels but the depth of penetration still depends on the % strength used. Again, if you’re new to peeling, you can start with the lowest concentration and work your way up. You will also need other tools like a fan brush and an acid neutralizer. Alternatively, you can buy them in sets for convenience. Best for: Normal to combination skin. A very light solution, that should be without any visible peeling after. The package comes with detailed instructions so this is a perfect starting point for beginners. It can help clear up mild acne as well as slough off dull and dry skin. The AHA collagen stimulation helps will the skin’s healing and rejuvenation. This is something that you can treat yourself with to a more regular basis as part of your skin maintenance. A single bottle is enough for 15-20 peels. This is a moderately strong solution that has retinol or vitamin A, which is a proven anti-aging ingredient because of its ability to induce younger and healthier skin cells. It also has chamomile and green tea extracts that acts as an anti-inflammatory and anti-bacterial agent. Cruelty Free – No Animal Testing on Products or Ingredients. 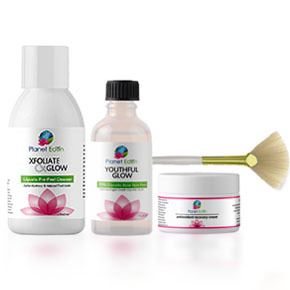 This set is a simple solution to anyone wanting to try chemical peeling but is lost as to whereto start. It has all you need from prepping cleansers to fan brushes. It comes in pre-moistened pads so you’ll never go wrong with the amount of solution you’ll use. 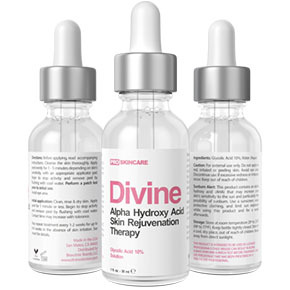 It has the characteristics of all acid peels, which is inducing exfoliation, cell turnover, and collagen formation. 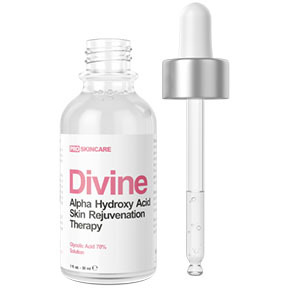 What makes lactic acid unique however is its ability to induce hyaluronic acid, the skin’s natural way of retaining moisture. It hydrates the skin and improves the skin’s natural barrier moreso than the other acids. It also brightens and evens out uneven skin tone, even difficult cases like melasma in darker-skinned patients. Lactic acid does all of this while keeping it gentle with minimal irritation. This makes it perfect for sensitive, dry, or dehydrated skin. 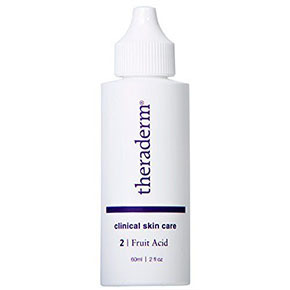 Theraderm - Fruit Acid Exfoliant (10% Lactic Acid) 2 fl oz. One of the gentlest types of chemical peeling available. This is unbuffered lactic acid that goes through the motions of exfoliation without the added risk of irritation. The low acid content will not cause burns or redness, and works great for those with sensitive or dark skin. This fruit acid exfoliant, in particular, is even safe enough to use on eyelids. This is step 2 of the brand’s renowned Skin Renewal System, which aims to improve skin health and helps fight against oxative damage & signs of aging. Cruelty-free. Free from: Parabens, Fragrances, Oils, Gluten. If you prefer a stronger solution for age spots or mature skin, a higher concentration may suit your skin better. This is great to use on the regular, every 2-3 weeks, to make sure your skin keeps its youthful glow whilst keeping pigmentation at bay. Kojic acid and bearberry are botanical extracts that are proven to inhibit melanin. This ensures that any pigmentation is also actively prevented with every session (as opposed to just being stripped by layer). This formula combines medical grade lactic acid at 50% strength with pure bearberry and licorice root extracts to help even out skin tone and fade any hyperpigmentation, age spots, sun spots, and reduce the appearance of scars. It also helps smooth out fine lines and wrinkles for a younger, healthier-looking skin. All of the other type of peels are water-soluble. This means that while it can exfoliate the upper layers of your skin, it won’t be able to get through any pockets of oil in the pores. For those with oily or acne-prone skin, you’ll need an oil-soluble peel that can cut through the oil so it can flush out the pores. This is where salicylic acid comes in. Salicylic acid is the only oil-soluble peel that is able to penetrate into congested pores to effectively exfoliate the pore lining. It’s able to unclog blackheads, whiteheads, and acne because of this. It’s also a good anti-inflammatory agent so it can help with some of the redness associated with acne. 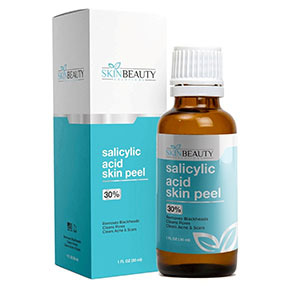 Salicylic peels have proven to have excellent results against hyperpigmentation and comedonal acne. With regular exfoliation, there will be less build up of dead skin and debris on the skin, resulting in less frequent bouts of acne. You skin will also me more susceptible to any topical medication and serums you use, increasing its efficacy. If you’re new to peeling, you can start with the lowest concentration and work your way up. Make sure to avoid this if you are pregnant or allergic to aspirin. 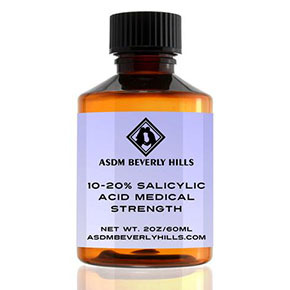 If you have oily but sensitive skin, this 10% salicylic acid solution is a good place to start. With regular sessions, you can improve acne-prone skin as this can deeply cleanse pores, remove deep-seated dirt and sebum, control oil production, and eliminate acne-causing bacteria. This solution is pure & unbuffered, meaning it retains its naturally low pH and will come at full strength and penetrate deeper into the skin. If you have experience with any type of peels, 20% is just right for you. This concentration is not too strong but can be very effective especially against more physical issues like large pores and blackheads. The tea tree oil and green tea give it its anti-bacterial and anti-fungal qualities, which has been proven effective in killing Propionibacterium acnes, the bacteria directly responsible for breakouts. Green tea also contains polyphenols, which is a powerful antioxidant that helps fight free radicals and restore youthful and vibrant skin. No Parabens, Sulfates, or Phthalates. Gluten-Free. 30% is a strong solution and is the standard in clinics. It can be effective for those suffering from acne as it helps decrease any scarring and hyperpigmentation, as well as purge any blackheads and whiteheads remaining in the skin. This can be used for warts as well. It can handle multiple skin conditions like acne inflammation and scars, sun damage, blemishes, whiteheads, blackheads, psoriasis, rosacea, and clogged pores. Does not contain colors, fragrances, fillers or any other unnecessary preservatives or ingredients. 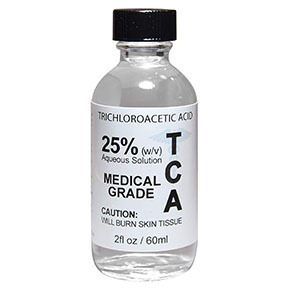 TCA or trichloroacetic acid have long been considered the de facto peeling agent for damaged skin because of its versatility and extensive history. Because TCA is a stronger acid than glycolic, lactic, and salicylic; these are used for medium and deeper type of peels because of its effectiveness against pigmentation, sun damage, and wrinkles. It’s used for facial resurfacing to correct discolorations like melasma, pigmentation, brown spots, sun damage, and uneven skin tones. It’s best for damaged skin as well, like leathery skin from tanning/sun damage or acne scarring. This is one of the best at home chemical peel for dark spots and sun damage. 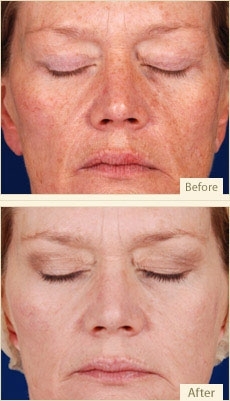 A series of medium depth peels have been proven to significantly reduce sun damage. 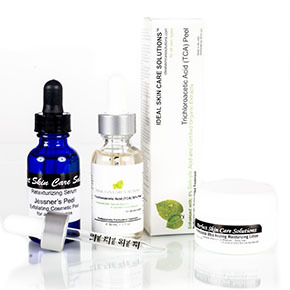 TCA is also used in clinics for skin rejuvenation, especially for mature skin. It improves skin laxity like sagging skin, fine lines, wrinkles, and crows feet. If you’re looking for the best at home chemical peel for acne scars and wrinkles, this is a great way to start. A light strength peel that treats acne and detoxifies skin. It purges the skin of dirt and bacteria, and in the process helps treat post-acne scars, discoloration, sun damaged skin, melasma, and smoker’s skin. It also helps refine skin texture and chicken skin (keratosis pilaris). Formulated with retinol and vitamin C, it boosts collagen and antioxidant protection to fight signs of aging. Comes with an after-peel neutralizer, so there’s no need for a separate purchase. This is a unique formula that combines both TCA and salicylic acid for a powerful exfoliator. It deep cleans to the clear out pores, unclog blackheads, whiteheads, and other impurities that can cause breakouts. This also has green tea and chamomile extracts that has anti-inflammatory, anti-bacterial, and antioxidant properties. Ideal for use by dermatologists, physicians, skin care professionals, and experienced home consumers. A very strong concentration tested for strict purity by the American Chemical Society. This is an unbuffered formulation, which means it retains its lower pH for a deeper, more effective peel. Recommended and has great reviews for scar reduction, skin resurfacing, stretch marks, skin rejuvenation, acne scars, age spots, wrinkles, freckles, tattoos, and xanthelasma. Avoid if you have sensitive skin, better to go with a lower percentage or dilute in distilled water. Included with this 25% TCA peel are: 2 Alcohol Prep Pads, Gloves & Instructions. This is a combination peel that provides medium depth peels. The TCA addresses acne scarring and fine lines, while the Jessner’s solution will target acne, pigmentation, dull skin, prevent infection and allows for faster recovery periods. TCA and Jessner combined have also been proven to be more effective against melasma in darker-skinned patients. The kit also comes with a moisturizer to speed the skin’s healing process. Fantastic deal. This TCA/Jessner kit is also available in 25% strength. A step up to 35% concentration, recommended for skin resurfacing, stretch marks, scar reduction, skin rejuvenation, acne scars, age spots, freckles, wrinkles, and tattoos. Ideal for use by dermatologists, physicians, skin care professionals, and experienced home consumers. This a very strong peel that is recommended only those with experience with chemical peels. Most users have recommended diluting the solution first to test and start at a lower strength. If not, you can neutralize much sooner. The brand Dermalure provides medical grade products for dermatologists, estheticians, and skin care professionals. 50% TCA is an extremely effective and popular stand-alone treatment for the strongest of skin-damage. This is deep peel used to resurface skin that’s been damaged by acne scars, stretch marks, hyperpigmentation, sun damage, and more. For home use, we recommend that peels from this point on should almost always be diluted as a start. You need to determine your skin’s tolerance and slowly working your way to full strength is the best way to start a new product. Another deep peel to undo skin damage like age spots, sun damage, acne, scarring, and hyperpigmentation among others. This concentration is best used as a spot treatment for issues like skin tags and milia, as well as a tattoo remover. This can also be used for TCA cross, a procedure used to improve depressed acne scars, ice pick scars, and large pores. Included in the package are 2 alcohol prep pads, gloves, and instructions. And again, because it bears repeating and one just can’t be too careful with this: read all indications and safety information attached to the product prior to use. This can have dramatic results but if used the wrong way, you can end up with chemical burns. Safety first! Do a patch test to make sure your skin can tolerate the strength of the product. Over the counter chemical peels usually come with instructions on how to properly perform a patch test. Only do a peel once a week to avoid damaging your skin. 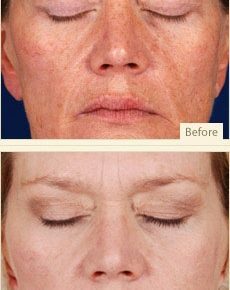 You can do a series of peels once every 6 months, 1 week apart for 5-8 weeks. It’s extremely important you do not leave the peel on any longer than the recommended amount of time to avoid damaging your skin. If you have acids in your skincare routine like retinoic, salicylic, or lactic acids, avoid using the at least 24 hours before doing a chemical peel. The same goes for any physical exfoliants in your regimen like scrubs. Peel type and strengths should be tailored depending on your condition. You know your skin best so be very observant especially on your first time. Cleanse with a gentle face wash and a washcloth. Avoid anything with exfoliants like beads or any other strong ingredients. You won’t go wrong with face washes that are aimed at sensitive skin. Pat your face dry before putting on the peel. Your skin needs to be completely dry before starting the process. Apply a barrier in your eye and lip area to protect them. You can use petroleum jelly. Get your timer ready. If it’s your first time, turn the timer on before you start applying the peel. If you’re on your 5th or 6th try, you can start timing your sessions once you finish applying the peel. Dip your gauze, brush, or cotton in the solution, making sure to squeeze out any excess to avoid any drips. As you wait for the timer to go off, you might feel a tingling sensation on your skin. You can fan your face to help with the discomfort. If it hurts too much, wash it off immediately. If you did the patch test though, you should be fine. Using lukewarm water or your neutralizing agent, gently. Be very gentle because it will be sensitive from the chemical peel. Make sure to wash thoroughly to remove any residue. You’ll notice that your skin will be brighter and clearer. For some, it might be slightly pink but this will subside in about an hour. Finally, you’ll have to nourish and protect your skin. You can use soothing gels like aloe vera, hyaluronic serum, or hydrocortisone at night. Again, products aimed for sensitive skin will be your best bet. This will help calm down the skin from any irritation you might have from the peel. Avoid using acids or exfoliants for the next few days to allow your skin time to heal. Avoid direct sunlight. The week after the peel, you’ll be more sensitive to sunlight. Avoid smoking to minimize the risk of any infections. Apply a sunscreen with at least the 30 SPF to protect the skin while healing and avoid any hyperpigmentation. Do not manually peel the flaking skin. This is very important because if you do, you’re going to create scabs and could potentially be infected. Use a gentle cleanser to avoid aggravating your skin. Aad.org. (2016). Chemical peels | American Academy of Dermatology. American Chemical Society. (2018). American Chemical Society. Asdmbeverlyhills.com. (2018). Buy Best Beauty Skin Care Products Online. Dermalure. (2018). Chemical Peels | Dermalure | At Home Lactic Acid Peel. Emedicine.medscape.com. (2016). Chemical Peels: Background, Indications, Contraindications. Khunger, N., Bhardwaj, D. and Khunger, M. (2011). Evaluation of CROSS technique with 100% TCA in the management of ice pick acne scars in darker skin types. Journal of Cosmetic Dermatology, 10(1), pp.51-57. Makeupartistschoice.com. (2018). Home Chemical Peels, Acne, Scars, Wrinkles, Hyperpigmentation, Anti Aging Professional Skin Care. Refreshskintherapy.com. (2018). Refresh Skin Therapy – All Natural Peels & Skin Therapy. Sanja Perić, (2011). Glycolic acid peeling in the treatment of mild to moderate inflammatory facial acne vulgaris. Sci. Res. Essays, 6(32). Sachdeva, S. (2011). CROSS technique with full strength TCA in the management of ice pick acne scars. Journal of Cutaneous and Aesthetic Surgery, 4(2), p.160. 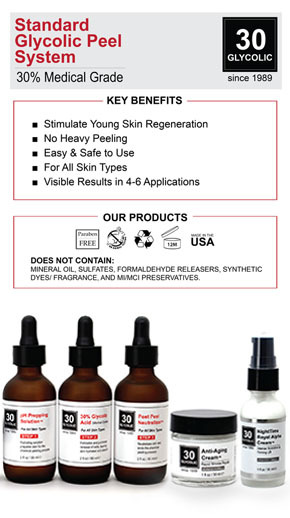 Skinbeautysolutions.net. (2018). Skin Beauty Solutions. Theraderm.net (2018). Theraderm: Your Source for Clinical Grade Skin Care Products | Theraderm® Clinical Skin Care.